TORONTO — There's a lot on the line for Kawhi Leonard and the Toronto Raptors this season. A two-time NBA defensive player of the year, Leonard is eager to show he's healthy again after being limited to nine games last year because of a quadriceps injury. The Raptors want Leonard at his best right now, so they can push for the Eastern Conference crown, but also hope their new star likes playing in Toronto enough to stick around when he becomes eligible for free agency next summer. Leonard was the biggest splash in a busy offseason for the Raptors, who traded a package including franchise icon DeMar DeRozan to acquire the 2014 NBA Finals MVP from San Antonio. "I want to do great things, so I'm going to make sure that I put all my effort on the court, each and every night," Leonard said in his first public comments with his new team. 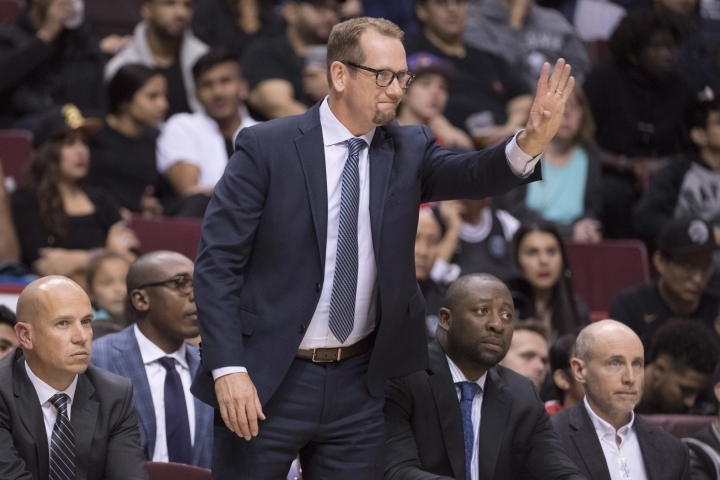 Toronto also fired Coach of the Year Dwane Casey, replacing him with former assistant and first-time NBA head coach Nick Nurse. "The summer was crazy but, you know what? Now it's basketball and we're excited," Raptors president Masai Ujiri said. The moves came on the heels of a franchise-record 59-win season, but were ultimately driven by the disappointment of three straight playoff exits to LeBron James and the Cleveland Cavaliers. 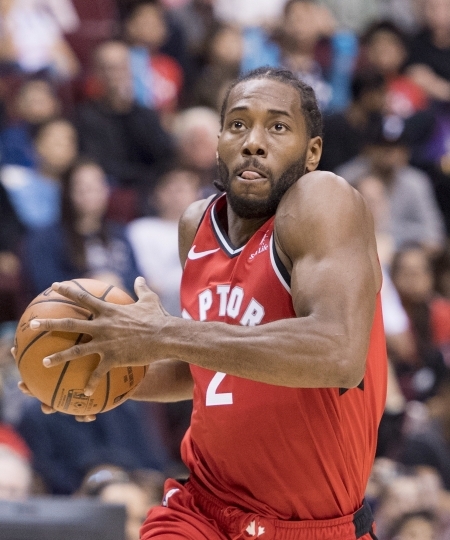 Leonard joins a lineup that includes four-time All-Star guard Kyle Lowry and shot-blocking big man Serge Ibaka, as well as a group of talented young players led by guard Fred VanVleet and forwards OG Anunoby and Pascal Siakam. In a new-look East, with LeBron James now playing for the Los Angeles Lakers, Ujiri chose bold change rather than another run with the team he already had. The goal: a first NBA Finals for Toronto, and maybe a championship. "You never know with these things," Ujiri said. "In our jobs, we do them first on paper and then they have to pan out on the basketball court." If they don't and Leonard ends up leaving, it's likely to bring about an even bigger roster rebuild in Toronto. Some other things to watch with the Raptors this season. Nurse has head coaching experience at the college level, in Europe, and in the NBA D-League, where he won league titles with two teams. He'd been Casey's assistant the past five seasons. Veteran C.J. Miles said he's impressed with the way Nurse has handled training camp. "He's very concise, to the point," Miles said. "Everything is organized, he's ready to go. He knows what he wants to teach that day, what the emphasis is, and we knock it out." Nurse acknowledged at the start of camp that Leonard was "a man of few words," but Miles said his new teammate hasn't been shy about making himself heard. "He does have a quiet demeanor, no question," Miles said. "But, for what I was expecting, it's 10 times more communication than I would have thought. He's been great. He's sharing his knowledge." While Leonard was the unquestioned headliner in Toronto's swap with the Spurs, the Raptors also received guard Danny Green, a capable 3-point shooter and quality defender. "Danny has probably been swept under the rug because everybody is focussed on Kawhi," Raptors guard Fred VanVleet said. "We got a hell of a player in Danny Green, too." Toronto's other significant acquisition was big man Greg Monroe, an eight-year veteran who's expected to come off the bench. Nurse said he's been "really happy and impressed" with Monroe's overall contributions so far. "He's been a pleasant surprise," Nurse said. "He's in shape. He's kind of a cheery, chipper, positive attitude type of guy, which every team needs. You can't have enough of that." Rather than giving his leading assistants defined roles, the innovative Nurse intends to change up responsibilities on a regular basis. "One of them will be working with the defensive side of the ball, one of them will be working with the offensive side of the ball, and one of them will be doing what we call special teams, timeout plays, out-of-bounds plays, et cetera," Nurse said. "And about 10 games in they're all going to rotate." Nurse's top lieutenants are Nate Bjorkgren, nine-year NBA veteran Adrian Griffin, and Italian Sergio Scariolo.